MG is a great fit for Shadowrun, duh. Team play, mission-based, fighting for what you believe in (in the cyberpunk sense) a world hostile to the "little guys." Will = Mind. Health = Body. Truncated skill list. Only 9 skills, representing all of the Shadowrun jobs. Skill-Softs! These are wises that you can slot before each mission. Like Kung-Fu, Helicopter, Security Systems, etc. You get 1, 2, or 3, depending on your runner experience level. Degree of success is spent on stylish/cool actions. No Recruitment yet. I'm doing pregen characters, so I don't need to re-write the full Recruitment questionnaire. More to come as I chop away at it. A more seasoned runner gets more, or less skill-softs? Good god, i just imagined tacticool firefights with the mouseguard combat system. I'm kinda crying of joy. Lovely lovely lovely. SR was my first game, and first heartache. really cool, this make Shadowrun far more simple and appealing. @Clyde: A more experienced runner gets more skill-softs, just like in normal MG a more veteran guard-mouse gets more Wises. I love this. Love it love it. 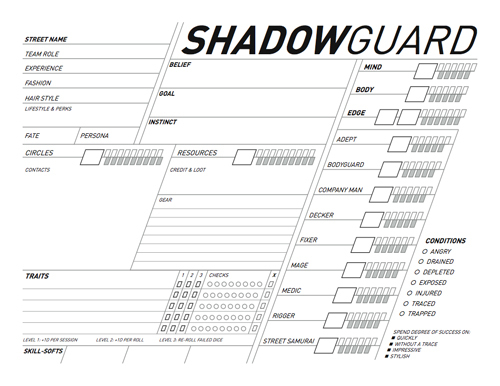 This hack is for running a Shadowrun-like game using the MG system. It's not about tiny cyber-mice doing shadowruns. We played Feng Shui SR, too. It was cool. I like the support MG has for Contacts (Circles) and Resources. We free-formed that stuff in the FS game -- and it was fine -- but having mechanics for it will be good. Also, the mission + obstacle format will make running the game really easy. I *highly* recommend Mouse Guard. One of the best RPGs ever. This is amazazing! And the individual goals make the game about more than just the mission, like it ought to be. I'm getting some friends together and making them play this! I find the way the lines draw my eyes to be... painful maybe... Something about the steep angle on a horizontal plain doesn't sit well with me. Played a lot of SR in the 90s - imagine playing it with a system that actually makes sense...sensational! Hi Mr Harper, last weekend i wrote you an email to oneseven@gmail.com. I didnt have an answer yet so i thought may be its not the way to contact you privately, or that you maybe have been busy. May i ask you to check that account and contact me whenever you can? Can you re-send? I don't see any mails from you in my inbox. @Keith: Yeah, I'm reconsidering the angle. Might make it less extreme. Nice! This might make me want to play Shadowrun, and that's saying something. Personally I like the angle and how it gives the sheet a 3D computer console appearance. Email re-sent. Check your inbox when you can. @john I think it would be okay on a vertical plain, as it would draw the eye naturally down the page. Maybe changing the angle on the horizontal from top left to bottom right might make it feel more natural, even with the steep angle. It's been said before, but I just have to say it again. This is probably THE most appealing character sheet I have ever seen. I don't know if it's enough to make me like Shadowrun, but it certainly helps. @Mr Harper, any news of your hack ? How do you translate the missions obstables (wilderness, weather, animals, mice) ? Excellent. Not necessarily for the system, but for giving me the idea of running a shadowrun campaign with mice. Hey - did anymore come of this? Would you share your pregen characters? I think this hack is an amazing idea and would like to see more of it. This is a brilliant hack. Please post more as you shake out the details. There are no dates on the comments.... Have you run this yet? Can we reasonably expect more to come?